Vision for 11th Street along the Allegheny River. 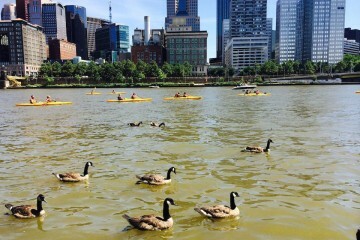 Photo courtesy of Riverlife. It’s an exciting time for riverfront development in Pittsburgh. The Highline development on the Mon was just announced and last Friday Riverlife presented the Strip District Riverfront Park Vision Plan. The plan envisions a public park, a new waterfront café with dock, an expanded marina, and a series of riverfront overlooks and fishing piers to draw residents, workers, and visitors to the water. The plan, completed by Sasaki Associates, is a result of public and private stakeholders coming together, years of public input and a mix of public and private resources, recommends reconnecting the riverfront to the urban fabric of the community and maximizing public access for recreation. While the vision will be implemented over the next five to ten years as financing is solidified, a cohesive vision of aligned stakeholders will ensure that as new development continues rapidly in the Strip District, greening and public access to the water is a priority. Map of Strip District Riverfront showing locations of public amenities. Image courtesy of Riverlife. 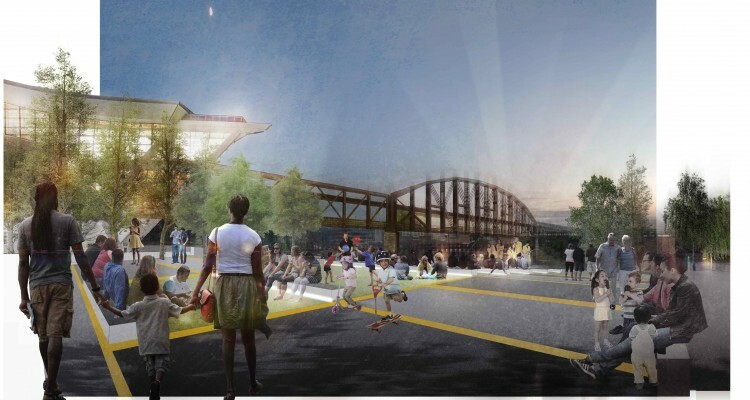 The Strip District Riverfront Park Vision Plan provides landscape design from 11th Street to 27th street with the hope that the park will extend to 31st Street eventually where it can connect to the Allegheny Riverfront Green Boulevard. The plan will retain industrial elements like this transmission tower at 26th Street. 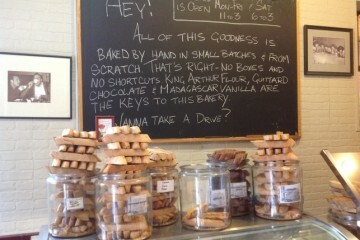 Courtesy of Riverlife. 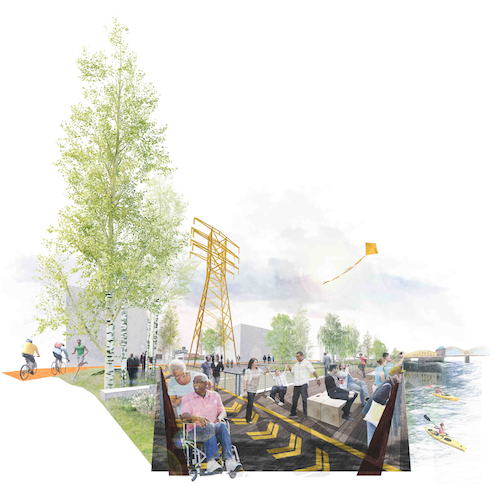 Focal points will be created at key perpendicular connections from the neighborhood and will offer places to step or ramp closer to the water’s edge, giving users multiple experiences fo the riverfront and, in some cases, enabling water access. Each of these perpendicular connections correlates with streets that fall under the City of Pittsburgh’s Complete Streets executive order that requires the planning of public streets, sidewalks and other key infrastructure to meet the daily needs of all users and accommodate a mix of pedestrian and transportation uses. 11th Street Plaza: a new public plaza will link the riverfront landscape of the Strip District to the Three Rivers Park and Three Rivers Heritage Trail downtown. With a series of terraces and an overlook that could serve as a stage, the space is designed for flexible use, ranging from informal daily gathering for the neighborhood to performances for the broader community. 15th Street Landing: a new riverfront landing is planned overlooking the river. 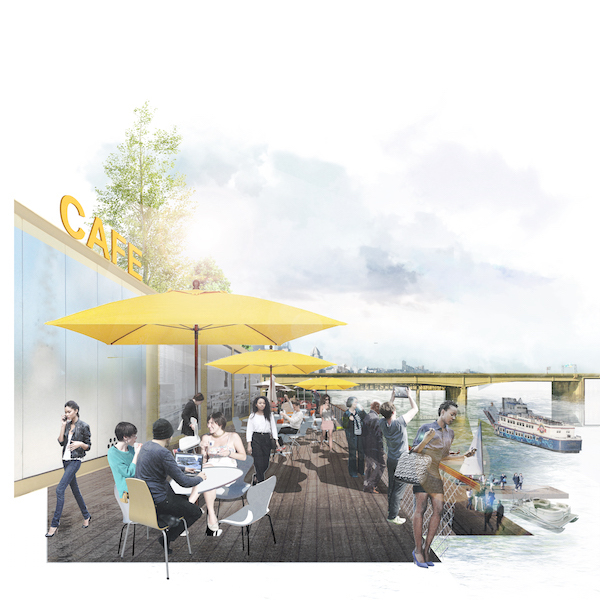 The 15th Street Landing will provide an opportunity for a new programmed space on the river, such as a pop-up café, food vendors or casual dining. A ramp connecting to several boat slips allows patrons the unique experience of arriving for a bite to eat by water. The Landing will be a new attraction drawing neighbors and visitors to the Strip District’s riverfront. 21st Street Overlook: A new overlook/fishing pier is planned to reach out from 21st Street toward views downriver. The foundation of the overlook will be a unique onsite relic—a historic crane foundation that sits in the river. The focal point at 21st Street will also ramp down to connect to the existing marina alongside the site, providing water access as well as a connected riverfront trail at the upper level. 26th Street Banks: The riverfront from 24th Street to 27th Street is an area of reinvestment for the Strip District. The collapsing river bank will need to be rebuilt near 24th Street at the Crane Building, allowing multiple experiences of the river with both upper and lower level pathways. At the terminus of 26th Street, a grand stair will step down to the water, allowing large gatherings or smaller groups to view the river. At the lower elevation, a fishing area in the dock will support waterside recreation. Along this stretch of riverfront, the slopes are laid back to enable a more natural bank ecology and support native habitat. Because of its wide right of way, the redesign of 21st Street offers a unique opportunity to integrate stormwater treatment into the streetscape design. 21st Street has the potential to become a testing ground and a model of stormwater best management practices in the urban context of the Strip District. A cafe on the water at 15th Street in the Strip District. Courtesy of Riverlife. Though it may seem like a long way off, the careful planning and cooperation from a variety of stakeholders ensures that the new vision for the Strip District Riverfront Park will preserve the Strip District’s authenticity and industrial past while providing amenities that present-day Pittsburghers have grown to love: trails, viewsheds and riverfront dining. “We’re keeping Pittsburgh…Pittsburgh,” says County Executive Rich Fitzgerald, noting that the vision plan ties in with Live Well Allegheny, an initiative to improve the health and wellness of County residents. Check out a video about the Strip District Riverfront Park Vision Plan on Riverlife’s Facebook page or download the complete vision plan at www.stripriverfront.org.